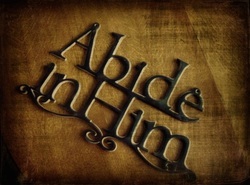 Joh_15:7 If ye abide in me, and my words abide in you, ye shall ask what ye will, and it shall be done unto you. Col_3:15 And let the peace of God rule in your hearts, to the which also ye are called in one body; and be ye thankful. Col_3:16 Let the word of Christ dwell in you richly in all wisdom; teaching and admonishing one another in psalms and hymns and spiritual songs, singing with grace in your hearts to the Lord. 1Jn_2:14 I have written unto you, fathers, because ye have known him that is from the beginning. I have written unto you, young men, because ye are strong, and the word of God abideth in you, and ye have overcome the wicked one. 1Jn_2:6 He that saith he abideth in him ought himself also so to walk, even as he walked.